As of May 1, 2017, PC Matic will be updated to PC Matic 3.0. This update includes significant updates to the PC Matic software, as well as the user interface. This email is simply a breakdown of the updates for both. Makers of PC Matic 3.0 wanted to ensure their customers were aware of the enhancements, and what to expect as these changes are implemented. It is also important customers understand, this is simply an upgrade to the existing product. There is not an additional charge related to this update. 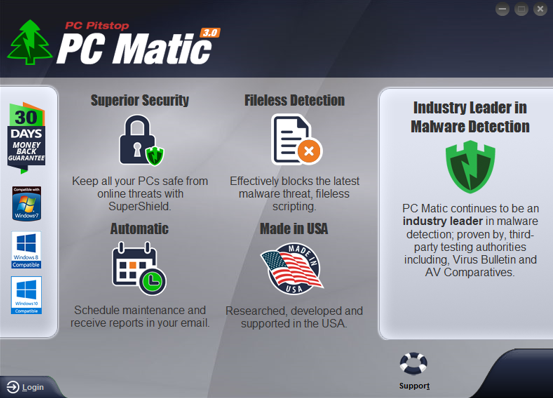 PC Matic 3.0 will continue to provide superior security, adblocking technology, free cyber security training, and PC optimization tools. The recent changes made to the software include the ability to detect file-less ransomware. Traditional malware, including ransomware, required an executable to infect PCs. The PC Matic whitelist was, and still is, effective in blocking malicious executable attacks. However, file-less ransomware is not initiated with an executable. Instead, malicious scripting is used. PC Matic has been conducting endless studies regarding the file-less ransomware infection process from beginning to end. By doing so, their developers were able to implement a solution within their program to effectively block file-less infections. This is the only security program that offers, not only a real-time, global whitelist solution, but protection from scripting attacks as well. 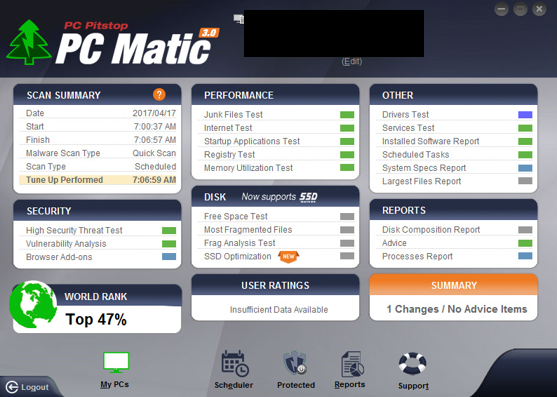 The file-less ransomware detection has been added to all versions of PC Matic, including PC Matic Pro and PC Matic MSP. Users do not need to implement any specific settings, or change any of their options. The file-less ransomware detection will run automatically. 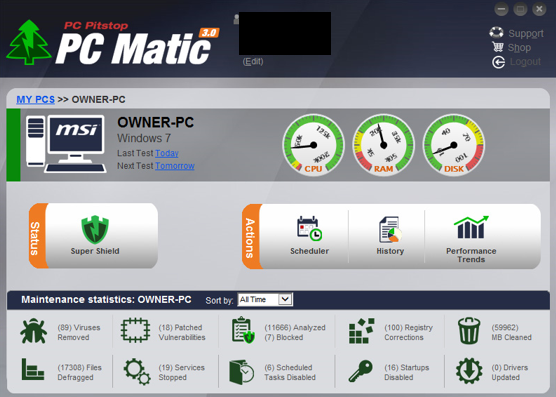 The PC Matic user interface has been updated reflecting the update to PC Matic 3.0. The user interface updates only impact PC Matic home users. These changes were not carried over to PC Matic Pro or PC Matic MSP. 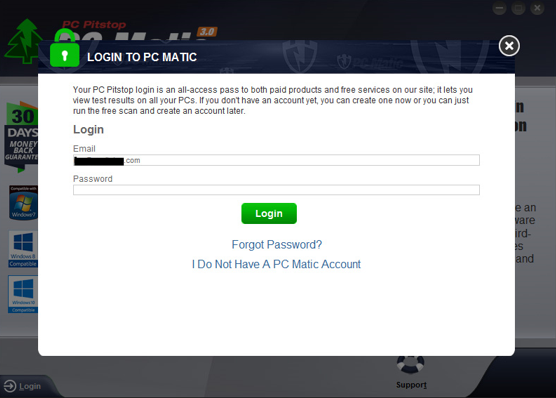 From here, PC Matic 3.0 users will log in as they always have. PC Matic 3.0 also enhanced the display for specific PC details. To access the screen below, users need to click on which PC they’d like to obtain additional information about. Lastly, the scan results screen has a new look as well. If users have additional questions or concerns regarding these updates, they can reach our support team at www.pcmatic.com/help. The makers of PC Matic want to reiterate, the update to PC Matic 3.0 does not cost users any additional funds. 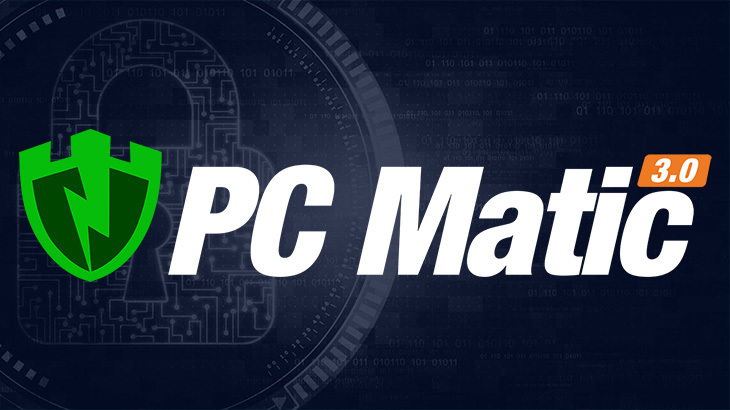 The PC Matic 3.0 software is an enhanced level of protection, not only with the global, automated whitelist, but also with file-less ransomware detection. Again, this update will be pushed through on May 1, 2017. 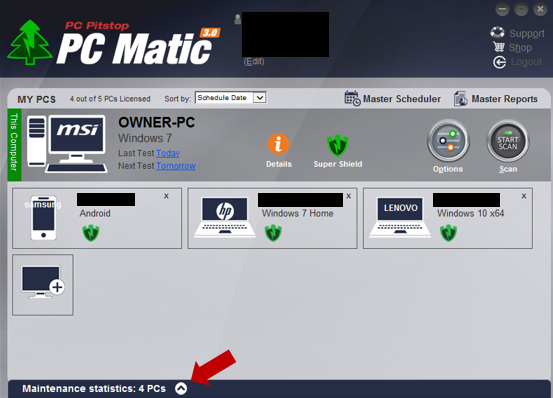 Therefore, once you run a scan, on or after that date, PC Matic will recognize an update is due. Upon scan completion and restarting your PC, PC Matic will be updated to PC Matic 3.0. Judy – Please reach out to our support team at http://www.pcmatic.com/help. They will be able to assist you with all of your inquiries. Thank you! 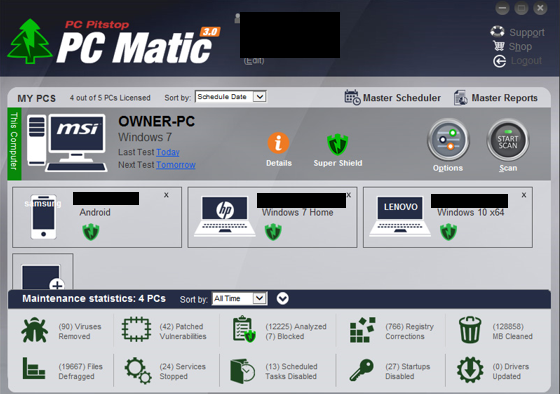 One PC Matic license is usable on up to five devices. We do not sell PC Matic for just one PC — however, you can always install the software on other PCs that are not in the same household (friends/family, etc.). Love the product and the update. I have been a customer for five years. I keep trying Super Shield and keep deleting it. It slows down the laptop to the point of frustration. There are always popups on the screen telling me there are problems ( a good thing ) but no way of fixing them ( bad thing ). Last attempt to use had SS flagging microsoft problems and google prolems. Again no way to fix. Sneak Peak? – that’s a crafty mountain. Do you mean Sneak Peek? – that’s a crafty quick preview. Looks great. Now lets see it work. Thanks. I have 4 PCs and an Samsung Galaxy S4 Mobile. I’m redoing my schedules in anticipation of 1 May upgrade to 3.0 on PC and 3.1 on Mobile. Schedule for mobile asks for drive as it can’t identify. What should I put there? Please reach out to our support team at http://www.pcmatic.com/help. They will be able to assist with any issues you may face. Thank you. Awesome that a new update is coming out. Looks awesome, too. I love PC MATIC! It’s a worry off my mind and well worth the money. Wow, this looks great. Im excited to see these changes. Nice work. Hi, It seems we are having a problem getting our other pc connected to pc matic. Can you assist? or do I need to ask someone else. Hello Kathy! Please reach out to our support team at http://www.pcmatic.com/help for assistance. They are available 7 days a week.